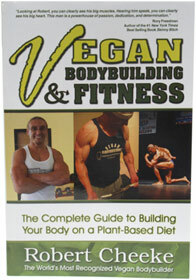 The first book devoted to the topic of vegan bodybuilding is here! Robert Cheeke is the world’s most recognized vegan bodybuilder, and he’ll be your personal trainer with this fantastic guide to getting fit the cruelty-free way. Covering all the basics for diet and nutrition, training, supplements and more, this book is an excellent guide to all aspects of getting in shape, whether you’re out to get big and strong or are just looking to improve your running time and lose a few pounds along the way. If you’re new to vegan bodybuilding and fitness, this book is an exceptional starting point that will cover all your needs for how to get started transforming your body naturally to get the physique you’ve always dreamed of. Even if you’re experienced, there’s a lot to learn from Robert as he supplies exceptional information on planning a successful diet program to meet your goals, helps you devise a training protocol that will optimize your results, and gives pointers on staying focused to reach the goals you’re after. No longer are you stuck with a book that focuses on the supposed “requirement” to eat a meat-based diet to get leaner, stronger and faster than ever before – Robert gives you all the tools you’ll need to have exceptional results training as a vegan, proving you don’t need animal-based foods and supplements to achieve incredible results. 317 pages. Cover price is $19.95 per copy, our everyday price is $16.95! From FoggyVegan of San Francisco, California on 9/24/2010 . From Anonymous of Los Angeles, California on 8/16/2010 . Great Book! Motivational and a must read for people interested in getting lifting weights and getting in shape. Lots of great insights for vegan bodybuilders. From Emile of Madrid, Spain on 8/10/2010 . Nice and inspiring book, gets you motivated to work on yourself. Entertaining & inspirational - must read! From Lisa Snow of NYC, New York on 6/25/2010 . Lots of great info for all athletes, not just bodybuilders. Great for active people who don't happen to be athletes, too. Robert's fun-loving personality really shines through, making this an easy read, not just informative. From Beth Sopko of New York, New York on 5/21/2010 . You don't even have to be a bodybuilder to benefit from this book; Robert gives a common-sense approach to toning your body and regulating your protein intake. I just got the book this week and am looking forward to the next phase of my life. Robert practices what he preaches, and the results show!